I caught this view from a taxi the other day. 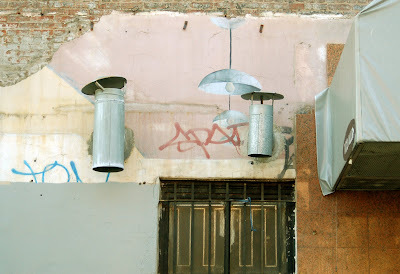 I wonder who might have painted the little trompe l'oeil hanging light bulb and why. Isn't it great that someone took the time to notice such a mundane detail like these vents and chose to highlight them in such an unusual manner? It's too high to be noticed from the sidewalk, so I was just fortunate to notice it from the cab. WAHOO! I thought I missed them because the link was "gone" on the last post - but I'm in! Hurray! I can't wait. Thanks! It took me a minute to notice the hanging lamp. It looks so real! Hi - the pattern arrived in Glasgow today - not bad, 5 days from US to UK. I really want to sew this RIGHT NOW, but I@m going to wait until I get some fabric that I really love. Are you going to have any more patterns for this backpack in the future? I love NYC for the abundance of stuff like this. Cool shot.